We recently took a Princess cruise to the Mexican Riviera on the Grand Princess. This was our third sailing on the Grand since she was commissioned in 1998. You might wonder, after 20 years of service and tens of thousands of passengers, how does Princess keep her looking fresh and appealing to prospective guests. We interviewed the Captain and Hotel General Manager, and along with inquiring about their work we asked some questions about the age of the Grand Princess. The present Master of the Grand Princess is Captain John Harry Smith. Captain Smith started his career at sea as a deck hand on an oil tanker. He worked his way up the ranks and has been with the Princess Cruise Line since 2007. In our years as travel photojournalists we have interviewed many ship’s Masters. Captain Smith manifests the same professionalism and confidence that we have learned to expect from all the members of his highly trained and respected vocation. On the subject of maintaining older ships in the Princess fleet, Captain Smith commented, “Having an inspired crew, and paying attention to details when it comes to cleanliness and appearance gives any ship vitality. Constant and vigilant maintenance allows older ships to remain seaworthy and popular among new and repeat guests.” To that end, each Princess ship is removed from service every three years, and the Grand Princess is next in line. In March 2019, the Grand Princess will enter dry dock in Portland, Oregon for repairs, maintenance, improvements, and inspections. She will be worked over from stem to stern, top to bottom, inside and out, by 1000 contractors from around the world. The work will be performed 24-hours per day, and the workers will live aboard the ship. Service will be provided by the ship’s regular hospitality crew during the entire process. All the work and numerous inspections will take just 13 days. Now that’s precision planning! While the Captain is responsible for literally everything, his primary areas of concentration are guest and ship safety, navigation, operations, and the environment. The Captain puts great trust in the person who is directly charged with keeping the passengers happy, i.e., the Hotel General Manager. The HGM is responsible for all guest services, including dining, entertainment, and housekeeping. Helmut Leikauf is the Hotel General Manager aboard the Grand Princess. There’s a ratio of about 2 guests to 1 crewmember on board a Princess ship. Approximately 900 of the 1100 hundred crew aboard the Grand Princess are guest-centric and report to the hotel organization. The HGM is an important officer indeed. Our ten day cruise to Mexico exceeded our expectations. The Grand Princess performed like the great ship she is, and the attentive officers and crew made it an exceptional vacation. We will write about other aspects of our Princess cruise to the Mexican Riviera in future articles. Contact your favorite travel agent or Princess Cruises directly. Ireland is referred to as The Emerald Isle because of its seemingly endless expanses of verdant trees, deep woods, and rolling green hills. County Wicklow is called the Garden of Ireland, and 47 of the county’s best acres are home to the Powerscourt House and Gardens. The Powerscourt site was first settled in the 12th century, but it was not until 1299 that a castle was finally erected by the namesake Power family. The castle and lands changed hands numerous times over the next four centuries. The Wingfield family was in possession in 1731 and built a magnificent mansion around the earlier castle structure. The existing manor evolved through several major modifications up through the late 1800s when the house was celebrated as one of the finest in all of Ireland. In 1974, a fire tragically destroyed the famous house. The ruins of the mansion were the only structures to be seen at the site for the next 22 years. In 1996, the owners of the Powerscourt House began the monumental task of rebuilding the old mansion to its current state of renewed grandeur. Artisans positioned new windows exactly in pre-fire locations. The entire structure was painstakingly and lovingly restored. Every effort was made to preserve the remarkable old building’s earlier epoch. Today, tourists visiting Ireland can enjoy the authentic and historic Powerscourt House and Gardens, a true Irish country estate that is simply awe-inspiring. The magnificent house was recently recognized as one of the top ten important houses in the world, and the gardens were voted number 3 best in the world by National Geographic. The elegant main house overlooks kingly Italian terraced gardens, the serene Triton Lake fountain and grotto, and numerous old statuary – many dating back to the early 18th century. An easy walk on estate grounds will take you to a Japanese garden, a horse pasture, and a centuries old pet cemetery as well as an exquisite walled flower garden. Just beyond the Powerscourt house is the River Walk. A private sloping wooded trail constructed in 1867 so the landowner and his family could enjoy a carriage ride to a waterfall and the Dargle River. The waterfall is the tallest in Ireland and cascades down almost 400 feet to the river. The road is complete with a dense forest of varietal trees originally planted for the pleasure of the 7th Viscount of Powerscourt in the 1870s. In more recent times, the woodlands have provided scenic backdrops for such popular films as Braveheart, Far and Away, Excalibur, and The Count of Monte Cristo. Just a few minutes’ walk outside the Powerscourt Estate lies the charming little Victorian village of Enniskerry. Built in the 18th century to house the tenants and caretakers who worked the estate, this classically Irish community offers tourists an opportunity to dine in local restaurants and browse a half-dozen boutique shops that line the main street. Bring your camera for shots of picturesque cottages and a historic clock tower in the village center. If you are seeking the perfect holiday escape, this is a place of Irish magic. The Powerscourt estate is in Eastern Ireland and nary 12 miles south of the Dublin International Airport and the city center of Dublin. Click here for more information about the Powerscourt House and Gardens. Happy travels, and — Happy Halloween! Whenever we travel, we are protected by Allianz Travel travel insurance. Visiting Québec this summer? Consider a stop at the Canadian national historic landmark Pointe-au-Pére. It deserves a spot on your itinerary. Favoring all destinations that involve water, we were drawn to Pointe-au-Pére’s nautical attractions – the Empress of Ireland Pavilion, Pointe-au-Pére Lighthouse, and the HMCS Onondaga – a Royal Canadian Navy submarine. We were particularly moved by the story and exhibit of the Empress of Ireland. The Empress of Ireland Pavilion houses a museum that opened in 2000 and contains a creative recounting of the history of Canada’s worst maritime disaster that took place just off the nearby headlands. In heavy fog, in the early hours of May 29, 1914 the luxury liner RMS Empress of Ireland was struck amidships by a steamship hauling coal up the St. Lawrence River. The steamer was fixed with an icebreaker bow that tore a 14-foot hole in the Empress. She sank in just 14 minutes. There were 1,477 passengers aboard the ill-fated liner – only 465 survived the frigid waters of the St. Lawrence. Even though the loss of life on the Empress of Ireland was in a league with that of the Titanic and Lusitania, the sinking of the Empress remains relatively unknown. Here are some reasons. The Titanic was a celebrity ship on her maiden voyage on the prestigious route between New York and London. There were many famous people aboard and her builders had bragged that the Titanic was unsinkable. After hitting an iceberg, she sank on April 15, 1912. The Lusitania had the distinction of being torpedoed by a German submarine on May 7, 1915, just under a year after the Empress tragedy. The Lusitania incident eventually led to the United States entering World War I. The Empress of Ireland was on a routine run across the Atlantic from Québec City to Liverpool – not a particularly prestigious route. There were no famous millionaires aboard, and apparently the loss of 1,012 ordinary lives was not remarkable at a time when tens of thousands were dying on the battlefields of Europe. The Empress tragedy was literally pushed from the front pages of every newspaper. Notwithstanding the lack of notoriety at the time, the Empress sinking was one of the world’s biggest civilian losses of life at sea. To this very day, there are over 600 bodies entombed in the twisted wreck of the Empress – just 130 feet below the surface of the icy cold waters of the swift St. Lawrence River. The detailed exhibits in the Pavilion are full of artifacts recovered from the ship. In addition, a dramatic film presentation documents the events leading up to the sinking. Had it not been for the early dark hour and fog, the Empress of Ireland accident could have been visible from the Pointe-au-Pére Lighthouse. Built in 1909, at 108 feet the lighthouse is the second tallest in Canada. The lighthouse is constructed of concrete with eight buttresses that support a central tower with 128 steps to the top. The light was deactivated in 1975, and it, along with the adjoining lighthouse keeper’s house, is now open to the public. The keeper’s lodge is a “Museum of the Sea,” in which there are several interesting exhibits about navigation on the St. Lawrence River. The HMCS Onondaga Attack Submarine was part of the Canadian Navy’s prestigious Atlantic Maritime Forces for over 30 years. She was decommissioned in 2000, and is now permanently docked at Pointe-au-Pére. The Onondaga is the only military submarine on public display in Canada. Visiting the Onondaga is an excellent opportunity to tour a modern submarine, which is quite different from the mostly WWII vintage boats that are open to the public in other parts of the world. Pointe-au-Pére is located in the Bas-Saint-Laurent region of the Québec Maritime. It is the traditional starting point for the scenic Gaspésie Tour known for outstanding landscapes, charming inns, and delicious foods including succulent lamb, artisan cheeses, and maple victuals. This national historic site lies three and one half hours northeast of Québec City. Drive along the south shore of the St. Lawrence on Route 132. Your destination is just 15 minutes east of Rimouski. Lucky is the family that gets to vacation in Québec and explore its history and many natural wonders. This beautiful eco-friendly province of Canada is a photographer’s dream that has adventures around every turn in the road. We like spending quality-time in The Maritime, and we think you will too. For more information about what the Québec Maritime has to offer, check out their website: http://quebecmaritime.ca. Take special note of their unique self-guided tours. Bodrum is an ancient port city in southern Turkey along the coast of the azure Aegean Sea. We had the pleasure of touring this interesting old city, which includes a medieval castle and an underwater museum. They are just two of the many attractions we found to tell you about. But first, a captivating history. In pre-Christian times, what is now Bodrum was a busy Persian Empire settlement called Halicarnassus. After a lengthy struggle, the city was conquered by the famous Alexander the Great in 334 BC. However, Halicarnassus has a 4,000 year history of conquest, and Alexander was not the first, nor the last to lay claim to the region. Some 17 centuries after Alexander, the Knights of Saint John – returning from one of the Crusades – chose a rocky peninsula in Halicarnassus harbor to build a castle dedicated to St. Peter. Construction on the Castle of St. Peter started in 1404 and the work was ongoing into the early 16th century. The chapel was the first structure completed in 1406. It was followed by four towers, each named after the country of the Christian knights responsible for the construction, i.e., England, France, Germany and Italy. Today the towers contain amazing sculptured carvings and relics from the sponsor countries. The walls and interior of this majestic castle and grounds are remarkably well-preserved and maintained. In the year 1523, and just as the Knights were completing their fortification, the Muslim leader of the Ottoman Empire, Suleiman the Magnificent conquered the entire area including the castle. One of his first dictates was to convert the castle’s chapel into a mosque, which it remains today. Since 1523, the castle has been a fortification, a prison, and a warehouse. In the early 1960s the Turkish Ministry of Culture turned the castle into an impressive history museum, and made it the home of the famous Bodrum Museum of Underwater Archaeology. The largest such exhibit of its kind in the world. The oceans of the world are ancient beyond memory or record. Man has claimed dominion of the seas, yet the seas are endless and forever, and man is temporal. Throughout history, man has challenged the unrelenting seas in a contest that has extracted a toll of untold thousands of lives and ships — some laden with cargoes and immense riches — all resting on the sea-floor and lost for millennia. The museum planners realized that there were hundreds, if not thousands of ancient shipwrecks in the waters surrounding Bodrum. Many of these vessels were carrying fortunes, and a castle fortification would be the ideal place to display them. In 1964 the lower area of the Bodrum Castle was dedicated to the display of underwater artifacts excavated from shipwrecks found in the Aegean Sea. Note: No part of the museum is underwater, a frequent misconception because of the name. After lying in the dark waters for thousands of years, the fascinating Bodrum Museum of Underwater Archaeology brings to light the mysteries so long hidden in the deep. The museum boasts 14 exhibit rooms of recovered relics of precious gems, jewelry, bronze, clay, iron and copper. One of the gold scarabs on display is inscribed with the name ‘Neferititi,’ the queen of Egypt. The only such artifact in existence. The museum also houses the world’s largest amphora collection, including 200 undamaged amphoras from the 5th century BC. An amphora is a container usually made of ceramic or clay and used to store wet or dry substances like grain or wine. Some amphoras date back to 10,000 years BC. Amphoras are particularly important to marine archaeologists because their unique designs help date the age of a shipwreck and the ship’s origin. There are painstakingly reconstructed shipwrecks in the museum. The ship named Uluburun dates back 3,500 years and is the world’s oldest surviving shipwreck. Adventurers and treasure seekers, armed with ever-advancing technology continue to discover the secrets of the deep, but discoveries are gradual – the oceans still give up their own, reluctantly. It is an interesting fact that most ancient wrecks occurred close to shore and in bad weather, and 95% of valuable relics have been discovered by sponge divers. Check with your travel agent. Several of our tourist resources are now reporting unofficially that Bodrum Castle, and the Underwater Museum are closed to the public for an undetermined time and reason. Although Turkey was one of the sponsors of our trip, we have not been able to obtain an official statement. Whatever the situation, we hope it is temporary. The first class museums in Bodrum are not only interesting, but important to our understanding of the ancient world. Copyright © 2018 Visit great vacation destinations with Wayne and Judy Bayliff. Photos Copyright © 2018 Judy Bayliff. When we travel the world we come face to face with history, some grand, and some that we would wish away if we could. This article is about the great stain on European history referred to as the Holocaust. There are many recorded stories about Holocaust horrors, and you may not be familiar with this one – we weren’t – until we came across a simple, poignant memorial. It was our first river cruise, and we chose Viking Cruise Line and an itinerary that sailed between Budapest and Bucharest in Eastern Europe. Our ship, the Jarl, was docked and waiting for us in Budapest. We were a short walk from the famous, often photographed, Hungarian Parliament Building that was inaugurated in 1896 on Hungary’s 1000th Anniversary. If you are not familiar with this magnificent structure, you may remember it as a feature of the Viking River Cruise ads on television. After checking into our stateroom on board the Jarl, we decided to take a stroll along the Danube to photograph the Parliament Building. Along the way we encountered a small group of people pondering over some small items lining the concrete bulkhead of the river. The objects of the group’s interest were shoes. Actually, sixty pairs of old worn shoes, all sculpted in cast iron. Men’s, women’s, and children’s shoes from the 1940s, perfect in every detail. So, this was a memorial, but who were the victims and who were the Arrow Cross Militiamen? We didn’t know, so we did some research. There were approximately 3,500 people shot along the Danube River in Budapest between 1944 and 1945 – mostly Jews and Gypsies. The site of the memorial was just one of several locations along the river bank used by the Arrow Cross in their executions of innocent people. Members of The Arrow Cross were Hungarian fascists sympathetic to the Nazi cause. Adolf Hitler used them to replace the legitimate government of Hungary during the Nazi occupation. They ruled as the “Government of National Unity.” They were in power just eight months, from October 1944 to May 1945. During that time, they killed or sent to concentration camps 100,000 Hungarian Jews. Why shoes as a monument? Because shoes are so personal. The men, women, and children to be massacred were ordered to remove their shoes, an act that we all can relate to – and therefore, easily imagine ourselves in the terrifying situation. After they removed their shoes, the victims were summarily shot, and their dead or wounded bodies fell into the cold rushing river. Ironically, this egregious and repugnant act took place just 1000 feet from one of man’s greatest architectural accomplishments, the beautiful Hungarian Parliament. The memorial is simply named, “Shoes on the Danube Promenade.” Like a visit to the Ann Frank House in Amsterdam, or the Auschwitz Camp near Krakow, Poland, a visit to the shoes in Budapest, Hungary is a moving and somber experience, and a stark reminder of the cruelty that man is capable of inflicting on his fellow human beings. This unique remembrance of the Budapest tragedies is the idea of Hungarian film producer Can Togay and sculptor Gyula Pyauer. The display was opened to the public in 2005. We are thankful that travel experiences generally celebrate the grandeur and beauty of our planet, and the spectacular achievements of mankind. Nevertheless, tributes like the “Shoes,” play an important role in reminding us that we must never lose sight of what can happen when evil takes the form of crimes against humanity, ethnic cleansing, and genocide. You might also enjoy reading another discovery article from our Viking River Cruise ­­­-­- click here. A cruise to Spain on Holland America’s Nieuw Amsterdam showed us there are many contemporary reasons to consider the ancient city of Valencia as a top-notch vacation destination. Since the time of El Cid – over the last thousand years or so – Valencia has seen Christian and Muslim conquerors come and go. Its history also includes being the birthplace of three European kings and two Catholic Popes. 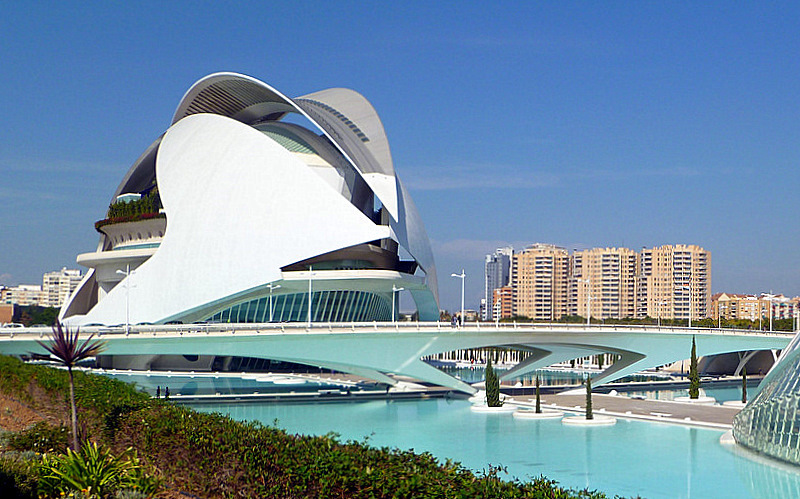 However, for the most part, Valencia played a quiet role in Spain’s colorful history – until the decade of the 1990s. 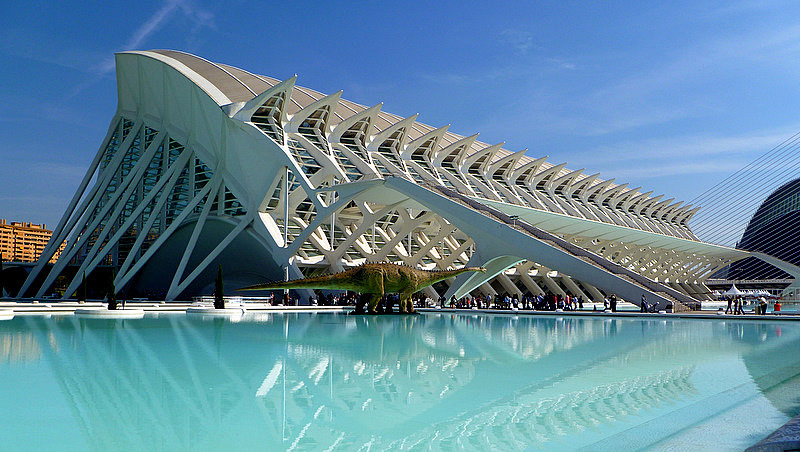 If Star Trek creator Gene Roddenberry (1921-1991) had lived to see the creation of the Ciudad de las Artes y las Ciencias by renowned Valencian architect, Santiago Calatrava, he might not have selected Marin County, California as the 2161 building site of the Starfleet Academy. 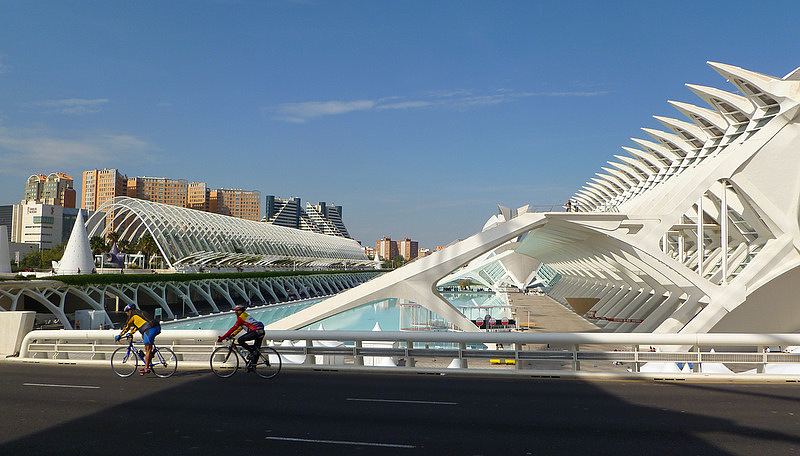 Instead, he may have asked Senor Calatrava to design it for him in Valencia. 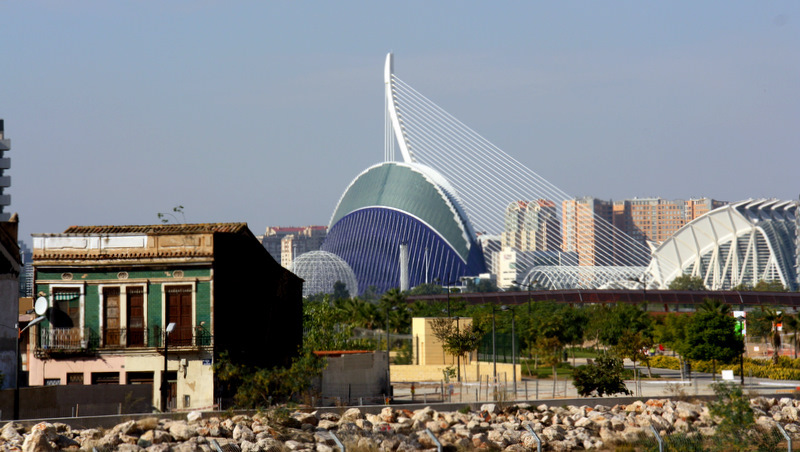 Construction on Calatrava’s amazing complex of otherworldly buildings began in 1998 along the old bed of the redirected Turia River at a reputed cost of more than $2.5 billion dollars. The Umbracle is the huge promenade entrance to the City of Arts and Sciences. Numerous lofty arches are covered in verdant vines that protect a garden and several species of tropical plants and trees. Along the colorful walk you will also find the ‘Stroll of the Sculptures’ an outdoor gallery of nine unusual figures by contemporary artists. The Prince Phillip Museum of Sciences opened in 2000 and its design is often said to resemble a whale’s skeleton, or a dinosaur’s spine. Whatever your muse, this magnificent exhibit is actually an interactive museum that will prove fascinating to anyone interested in the scientific disciplines that study everything from questions about The origin of the universe to contemporary issues like the enigma of climate change. 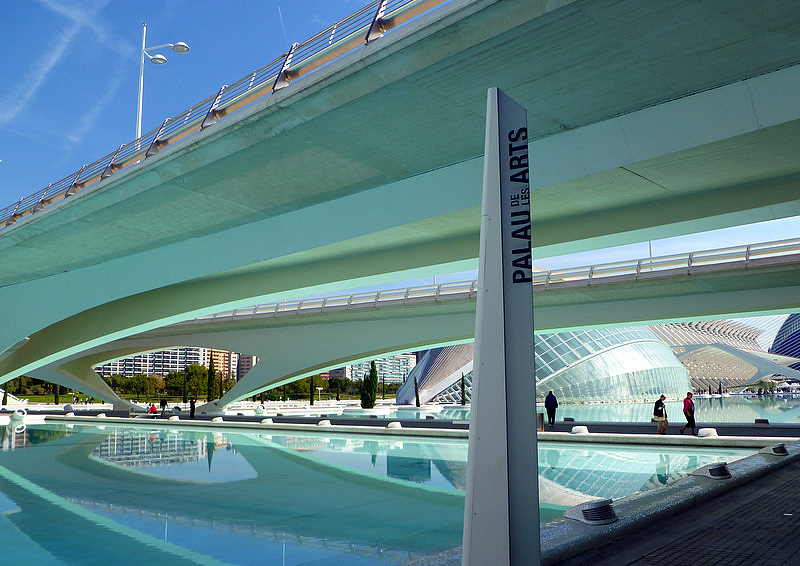 The Queen Sophia Palace of Arts sits amidst a setting of Mediterranean blue reflecting pools. 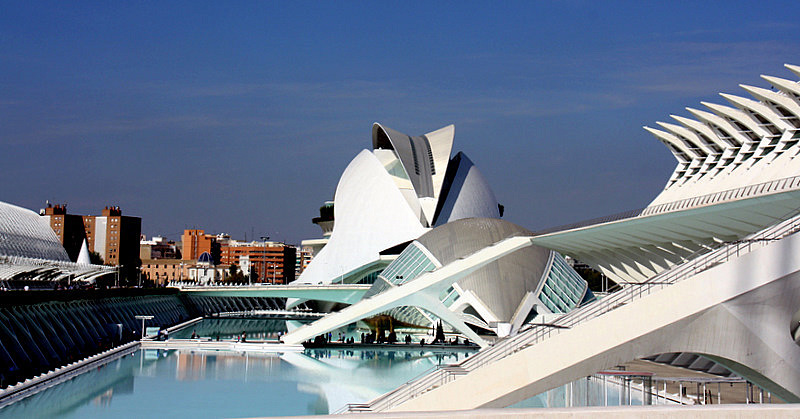 When it opened in 2005, it became the signature performing arts center in Spain for opera, theater, and dance. At 248 feet, it is the tallest opera house in the world. 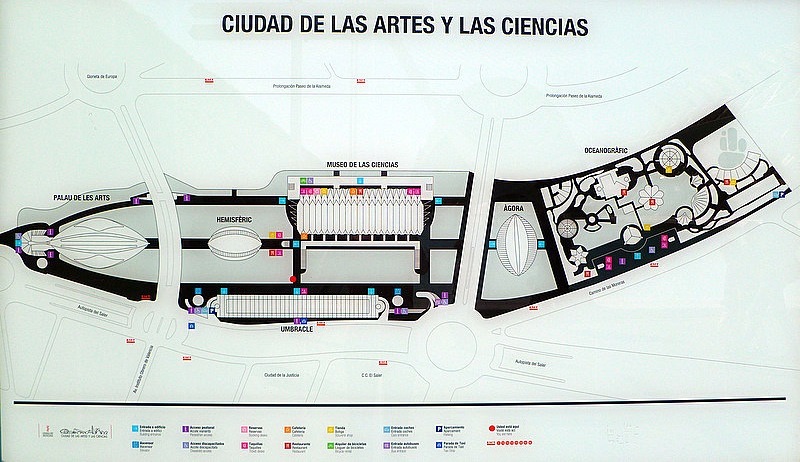 The site encompasses four multi-purpose auditoriums and the smallest hall seats 400, the largest 1,700 people. Proudly, the Queen Sophia Company hosts the Centre of Perfeccionament Placido Domingo, which is a celebrated program for young talented opera artists. As the name indicates, the program honors Spain’s most famous tenor, Placido Domingo. The Oceanographic is like an underwater city and is the largest aquarium in Europe. It features over 500 species of fish and mammal inhabitants collected from the world’s oceans. The oceanographic compound covers some 20-acres and includes an unusual aquarium restaurant with floor to ceiling glass walls where curious fish can watch you savor the catch of the day along with your paella. 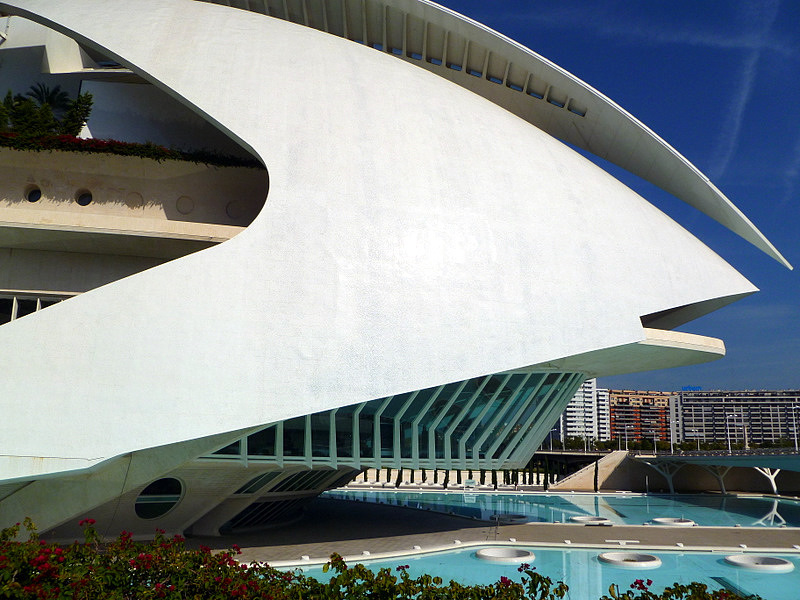 The Hemispheric is a visually striking eye-shaped Planetarium in the midst of a stunning turquoise pool. This popular attraction has a computerized astro-projector that shows the night sky with all the planets and stars on a screen so large you feel like an astronaut. There is also a laser show displayed on a 900 square foot screen, and visitors can watch IMAX and 3-D journeys through space. 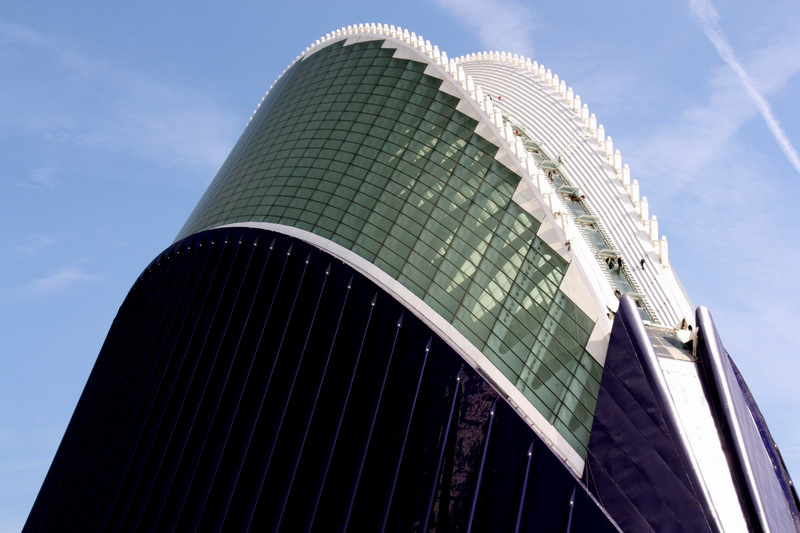 It is no wonder that the Hemispheric Planetarium is now one of the top five buildings visited in Spain. 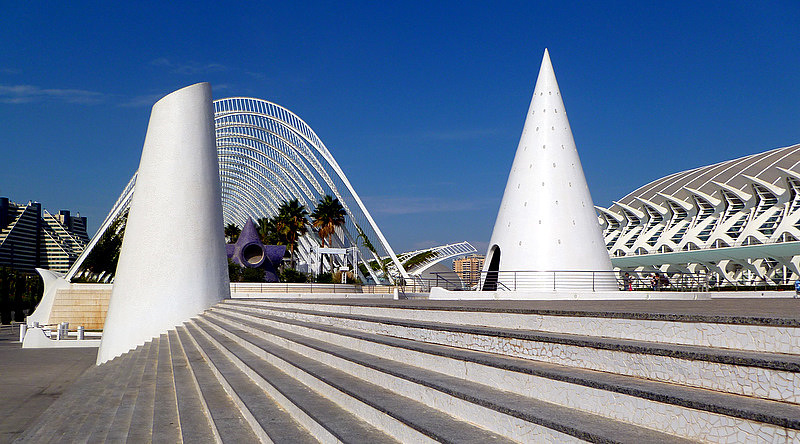 The Agora is the latest structure created by Calatrava’s architectural genius. This surrealistic multi-use sports arena is 262 feet high and seats over 5,500 spectators. 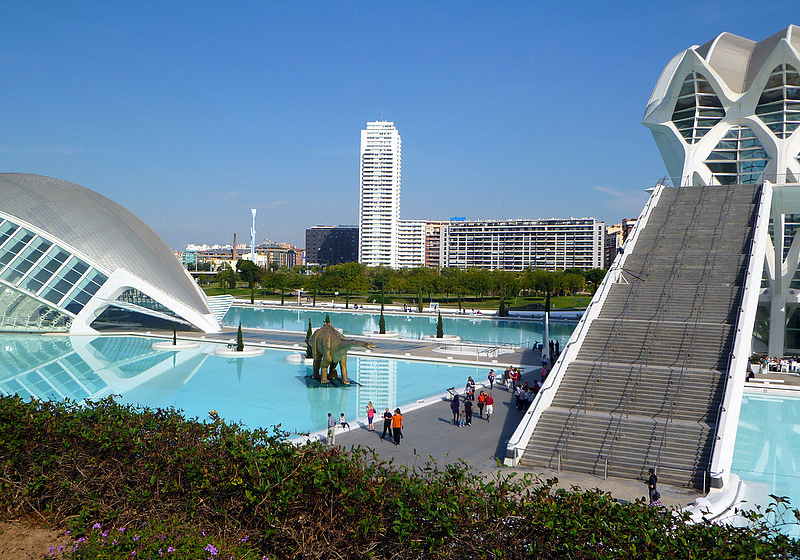 The various buildings of the Valencia City of Arts and Sciences have been called ‘techno-palaces’ and they certainly live up to the name. The scope of this unusual complex is breathtaking and an architectural marvel. The light, reflecting waters, shapes, and structural designs are a photographer’s dream. This is an intellectual Disneyland and could be a megalopolis base in the Galactic Empire in Star Wars. Speaking of which, do the views of the Palace of Arts remind you of Darth Vader for any reason? Visitors to Valencia will want to tour other attractions in the ancient city, like the Barrio del Carmen. 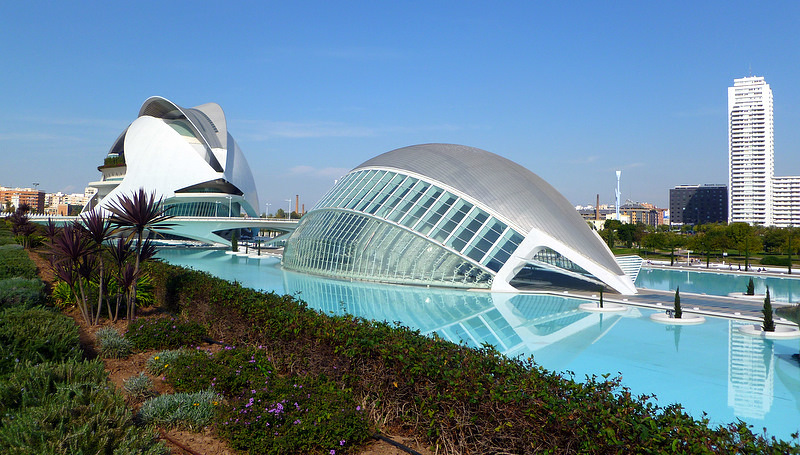 Our bet is that your most cherished memories of Valencia will include both Calatrava’s brilliant gift of a glimpse of the future right along with the historic monuments of the past. 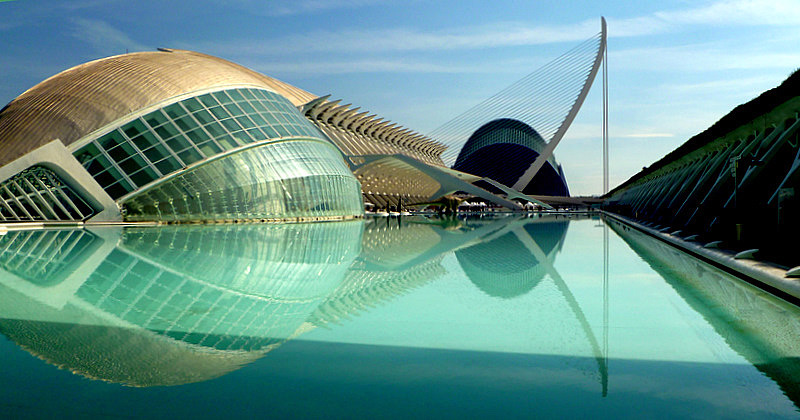 Valencia is 220 miles south of Barcelona on the sunny eastern coast of Spain. 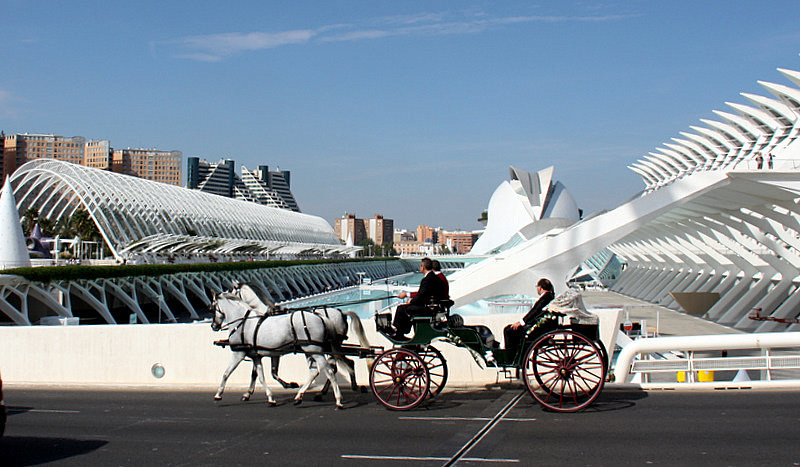 Valencia is easy to reach by all means of transportation. We flew to Barcelona from New York, with a stopover in Dublin via Aer Lingus. We enjoyed the Irish hospitality in the air. Check out their flight schedule *here*. We then boarded the luxurious Nieuw Amsterdam for a wonderful trans-Atlantic cruise back to the United States. For more information, or to book a cruise on Holland America, click *here*. 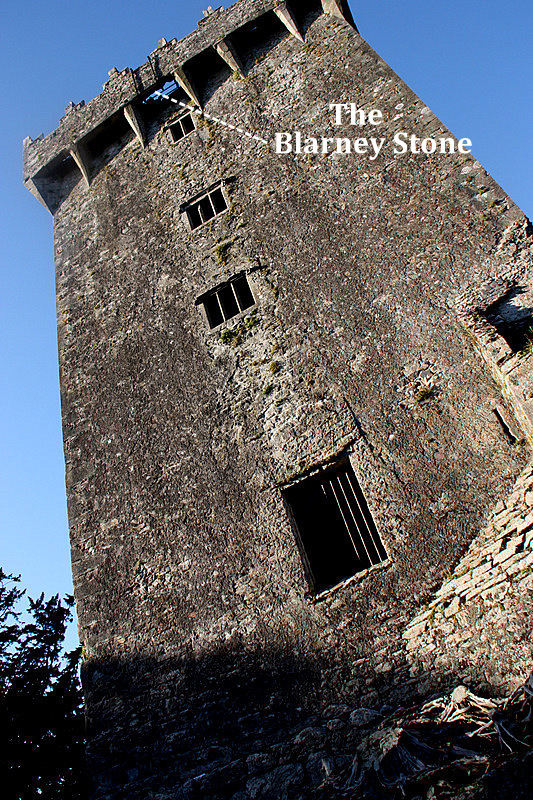 “The Blarney Stone,” is also known as “The Stone of Eloquence,” and it is both a legend and fact. If you have wondered about the location of this fabled icon, the answer is to be found atop the 12-foot thick walls of the bleak and eerie ruins of the magnificent Blarney Castle near Cork, Ireland. Come along and join our quest. 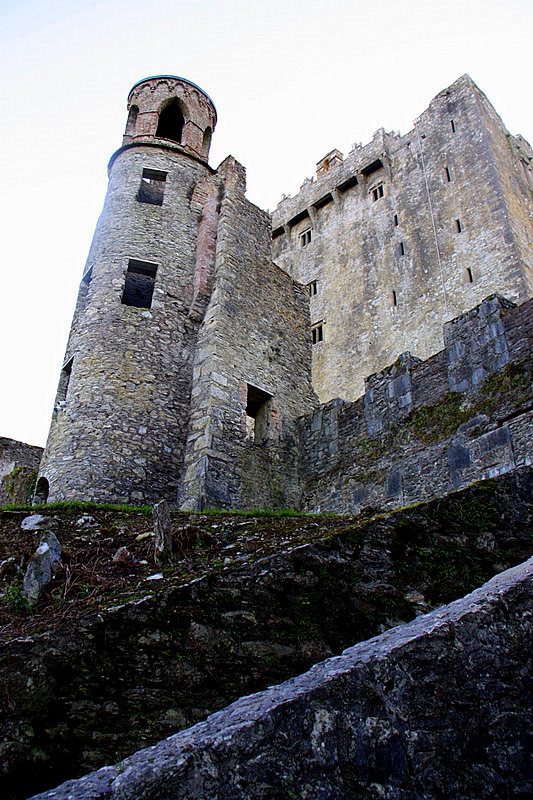 In early 15th century Ireland, a Munster king named Cormac MacCarthy constructed a grand fortress in the village of Blarney – upon the edge of a towering cliff near the town of Cork. The castle top was crowned with a machicolation that was built about two feet out from the main building and held in place by a series of large stone corbels. The objective of this separate wall was to protect castle defenders from flying arrows while they dispatched attackers with hot liquids and rocks dropped through the opening between the suspended outer wall and the structure’s main wall. During the castle construction, a good and grateful witch, who had been saved from drowning by a member of the builder’s family, placed a numinous power into one of the machicolation stones. Unfortunately, she chose a rock in the most awkward location on the battlement. The enchanted stone is set in the bottom of the outer wall positioned more than 5-stories above the ground. Well, you know how Leprechauns are. Before long the whole of Ireland knew of the magical powers of the Blarney Stone, and within 100 years – the whole world knew. 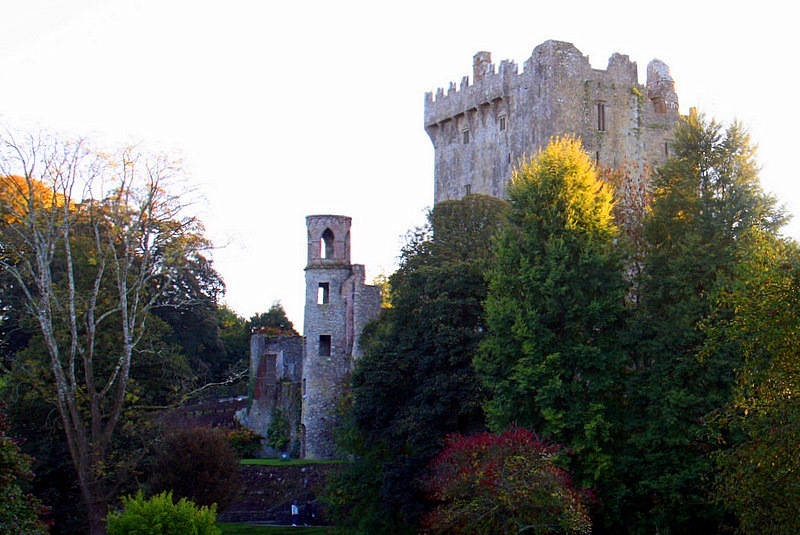 If you visit Blarney Castle to see the famous stone, you may as well get the benefits of caressing it with your lips, because it is very hard to get a good look at the Blarney Stone without being in the kissing position. The witch did not make this an easy task. 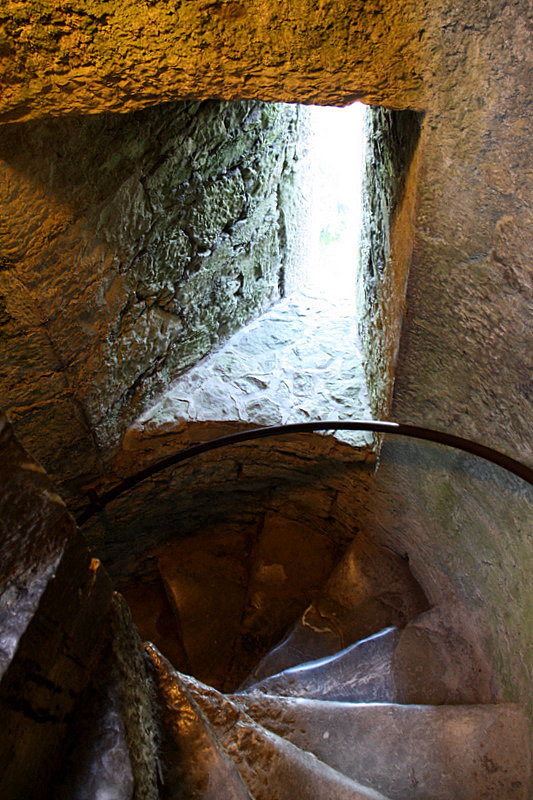 First, there is the long and laborious climb up a narrow spiraling rock staircase to get to the parapet. There is no elevator in the ruins. We counted 124 steps, but we may have missed a few. Once you reach the top of the castle and address the stone, the kissing effort requires you to lie on your back, grab onto two iron rails fixed to the outer wall, and wiggle and suspend your head and shoulders out into space in order to reach your objective. We can tell you first hand that it is a good thing to be on your back during this experience, because you would not want to be facing down. Visitors who suffer from acrophobia have a difficult time standing close to the opening. Not to worry, the castle provides an able-bodied helper to hold your legs while you stretch over the opening to put lips to stone. A note of caution that we learned the hard way – remove everything from your pockets before you assume the position. 300,000+ lip caresses a year have turned the stone’s kissing spot a rather dismal shade of dark gray. The color and sheen is understandable considering the many millions of people who have kissed the magic rock over the past five-hundred years. 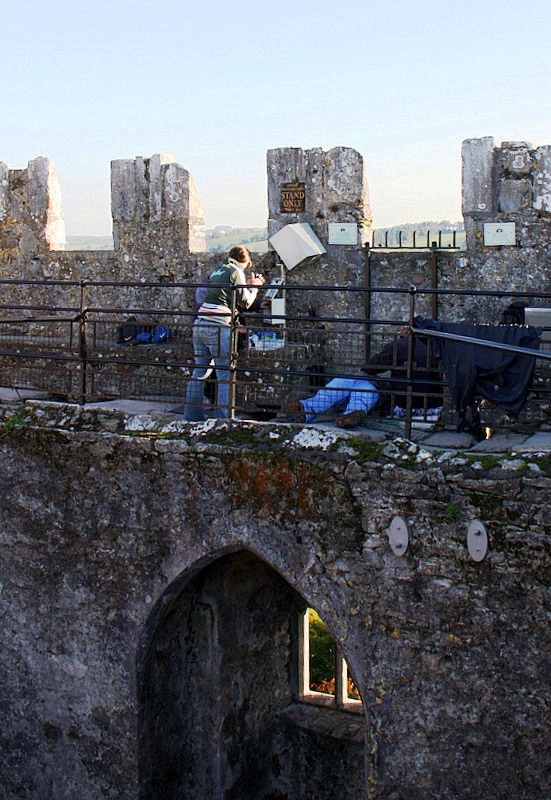 No one knows the full measure of famous and eloquent politicians, actors, literary giants, and business and religious leaders, who owe some – or perhaps all – of their success to the magic of the Blarney Stone. We flew from New York to Dublin on Aer Lingus. We enjoyed the Irish hospitality in the sky, you will too.